After a nightmare powder test on my Tailwind supplement which tested positive for an explosive, I finally boarded the plane and eventually made it to Zagreb, Croatia via Munich and an Über ride for 110 Kunas (much cheaper than a taxi) uneventfully. Zagreb is the capital city of Croatia and is home to one out of every six Croatians with a population of 790,000. Zagreb is the result of a merger in 1850 of two medieval towns, Gradec and Kaptol as Croatia struggled under control of several foreign powers including Budapest, Vienna, Berlin and Belgrade. The two towns were separated by a river which is now diverted and has been covered in pavement. Originally Kaptol was a bishopric and took on strong religious importance while Gradec was home to the Ban (Croatia’s governor) and the Sabor (parliament). 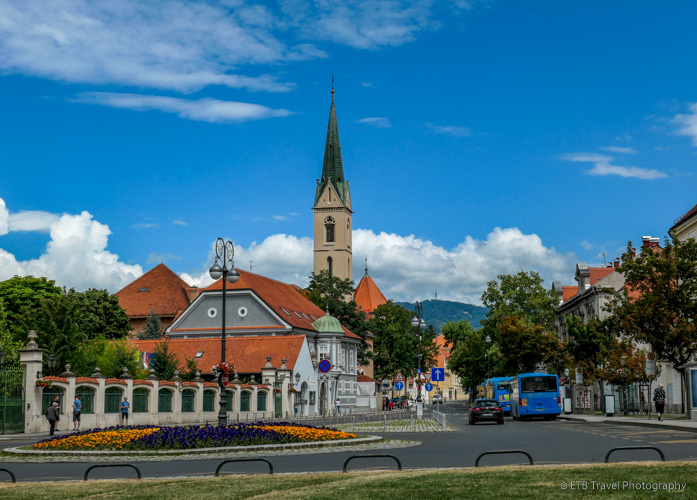 Now Zagreb encompasses these two towns in what is called the Upper Town and what used to be fields and farms in Lower Town. Without walking into any of the sights, a walk around the compact city takes about 1.5 hours to see the general highlights. I did this while I waited on Page to arrive at the Sheraton. While I would have preferred to stay at Hotel Jägerhorn, the oldest hotel in Zagreb and located in Lower Town just at the base of Upper Town, the 18 room historical building was sold out months prior to our arrival. Instead we resorted to the Sheraton located about 0.25 miles away from the city center and the meeting place of our tour in 36 hours. It turned out to be a good choice given the downpour on the morning of our tour when we would have had to schlep our bags to the meeting location had we stayed elsewhere. We enjoyed a nice room on the club level at the Sheraton, the staff was very helpful and the walk to town was pleasant, so I certainly can’t complain. Already through to the next round, Croatia was playing its third match in the World Cup round robin tonight. It gave us a good reason to push through our jet lag to meet Jackie and Jon for dinner and game watching. The Croatians prepared for the game in Ban Jelačić Square as we wandered up to Tkalčićeva street to find a place to eat. Tkalčićeva Street was once the river that separated Kaptol and Gradec. Now it is a street lined with cafes and bars. We stopped at a restaurant at the top of Tkalčićeva Street with good food and service, though the atmosphere was lacking especially with the blaring music from across the street, so we went in search of another place for a second course and game watching. We found the perfect location at Bulldog Pub just a few two blocks from the square. We could hear each other speak, watch the game, and then hear the echo from the Ban Jelačić Square when Croatia scored. Toward the end of the game, we made our way to the square to watch the Croatians donned in red and white checked clothing celebrate the 2-0 win! Today Page and I hit the highlights of Zagreb. We followed most of the same path I walked yesterday, though in much more detail. Beginning in the late morning, we headed toward Ban Jelačić Square next to the busy tram tracks and below Upper Town. The square, hopping with football fans last night, was much quieter this morning, though the stage and big screen remained for more football matches. The square is the meeting point for locals and holds many events. With Tito’s death in 1980, unrest in Yugoslavia, and ultimately the Independence of Croatia in 1991, the square returned to its previous name. In addition, the statue if Ban Josip Jelačić that was removed in 1947 by the communist party was resurrected. Though it originally faced its Hungarian foes, it now faces south toward the Serbs who were a foe in the most recent war. From the square, we climbed the hill to Kaptol to see the Cathedral of the Assumption of the Blessed Virgin Mary. Construction on the cathedral began late in the 11th century. Many additions, modifications and fortifications took place over the next several centuries before it suffered significant damage from an 1880 earthquake. It was reconstructed in the popular Neo-Gothic style at the time. Across from the Cathedral is a fountain that features the Virgin Mary with four angels that represent the Christian virtues of Faith, Hope, Innocence, and Humility. From the cathedral we walked down toward the Dolac Market which is bustling in the morning but empty in the afternoon. The market, where locals sell fruit, vegetables, cheese, meat and fish dates back to the early 20th century. The fruit and vegetable stalls are outdoors on the 2nd level while the meat and fish are sold below and indoors. After visiting the market, strolled up Radićeva Street to satisfy Page’s shopping needs then meandered down Tkalčićeva Street to a small park tucked in between the eateries where Coratians who were drinking their tivo (beer) last night were now sipping coffee. The park features a sun dial and a statue of Marija Jurić Zagorka, Croatia’s first female journalist and a champion of equal rights. From Tkalčićeva Street, we climbed up the stairs that led us past some houses to the Stone Gate and entrance to Gradec. Upon passing through the archway, I was surprised to find a small chapel dedicated to the Virgin Mary. The chapel holds a painting of the Virgin that miraculously survived a fire in the house above in 1731. Worshippers light prayer candles to the patron saint of Zagreb while the walls are adorned with plaques that give thanks to answered prayers. This might have been one of my favorite places in Zagreb simply due to its uniqueness. From the stone gate we climbed a little further to St. Mark’s Square which features the 13th-century St. Mark’s Church and is surrounded by government buildings. The church’s roof tiles are decorated with the coat of arms of the Triune Kingdom of Croatia, Dalmatia, and Slavonia and the city of Zagreb from the 19th century when the church was substantially rebuilt. The church is only open for services, but with the government buildings nearby, protest demonstrations took place in front of its decorative door while we were there. From the square we turned to our left and stopped in the Croatian Museum of Naïve Art. The one floor museum includes 3 or 4 rooms of impressionistic paintings by Croatian peasant artists completed during the 1930-80 time period. The small museum, which only costs a few dollars to enter, is considered the world’s first museum dedicated to naïve art. It was a nice, quick stop before we continued past St. Catherine’s Church (only open during services) on to the Strossmayer Promenade and the lookout in Lotrščak Tower which both provided spectacular views of Zagreb and the funicular. The 66-meter-long funicular connects the Upper and Lower Town with a 55 second ride. The shortest passenger cable railway in the world operates every 10 minutes, though we never saw the cable car move. When it opened in 1890, it was operated by steam and was the first ever public transportation in Zagreb. It pre-dated horse drawn trams by a year. After visiting the tower, whose cannon is shot off everyday at noon, we walked down the stairs through Hotel Jägerhorn to a busy street of trams, cars, and bicycles where we found the Illusion Museum. On this busy street was the Museum of Illusions. We spent a fun 30 minutes here looking through kaleidoscopes, playing with puzzles and entering fun rooms before we left and headed to lunch in the same area where we watched the game last night near Petar Preradović Square, also known as the flower square since flower stalls have been a feature here since the 14th century. From the myriad of cafes on the surrounding streets, we selected Submarine Burger for a natural burger and truffle fries. They liked their mayonnaise at this restaurant just like they liked their mustard at the Bulldog…heavy on the sauces. Fighting off jet lag, we made a final push to walk off our heavy lunch and headed to the Green Horseshoe, a U-shaped belt of parks. Our first stop was at the Republic of Croatia Square which is home to spectacular flowers and a magnificent building which houses the Croatian National Theater. From here we traveled South to the Botanical Gardens which were free to enter, but were relatively unexciting to visit. Perhaps this was because it was one of the last sights we visited of the day. After heading East through the gardens, we turned North into King Tomislav Square located across from the train station. A statue of King Tomislav, crowned as Croatia’s first King in 925, overlooks the square from the south side while the decadent Art Pavillion is situated on the north side. Just north of King Tomislav Square is another park named Nikola Šubić Zrinski Square. This park with its shade trees, fountains, and many flower beds is just lovely! It is wonderful place to just sit and enjoy the green space or try a tasty treat as many vendors sell dessert here. I highly recommend the Trdelník. Page and I split one of these sweet pastries covered in a mixture of sugar, vanilla, and cinnamon, and it was fantastic! The dough is wrapped on a roller, cooked, and then warmed over a flame to caramelize the sugar. It also comes with sauces like Nutella. After a short rest back at the hotel, we once again met Jackie and Jon for dinner at Heritage, the number one restaurant on trip advisor. It closes early and runs out of food, so it is probably best to go for lunch. That said, we scored one of the two outdoor tables (only three bar stools inside) and ordered the typical Istria food with our server’s help. We snacked on a variety of meats and cheeses as well as breads with spreads and toppings, and made it back to the hotel before the rain threatened. Previous Post Brazil Posts are Now Available on GPSMyCity with Offline GPS Guided Maps! Ok first, I want the story on the gun power test on your Tailwind supplement, whatever that all means! Love to Page and if you are going to be in Prague next week, give a holler! Glad to hear that you enjoyed your time in Croatia! Zagreb is a fun city–and new things are popping up all the time!